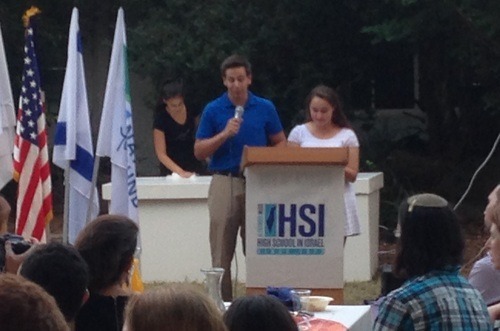 We would like to extend a BIG thank you to all of our students, staff and supporters, including alumni, parents and the JNF L’Chaim Solidarity Mission, all of whom joined us for our final summer banquet last night, July 27, 2014, at the AMHSI Hod HaSharon Campus. Jewish National Fund, a proud partner of AMHSI, organized the Solidarity Mission to Israel commendably on very short notice. 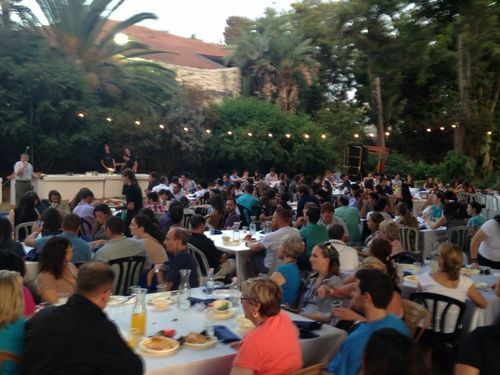 Joining us at our banquet were not only participants of the Mission, but also members of the JNFuture Mission and young olim chadashim (new immigrants) through Nefesh B’Nefesh who come from all over the United States. It was especially rewarding to see several AMHSI alumni among our special guests! After landing, the mission made its way to campus in support of our students who have completed a transformative six-week session with us in Israel, and the extended AMHSI family for providing the journey of a lifetime. We welcomed 230 attendees at the final celebration. Here is Amb. 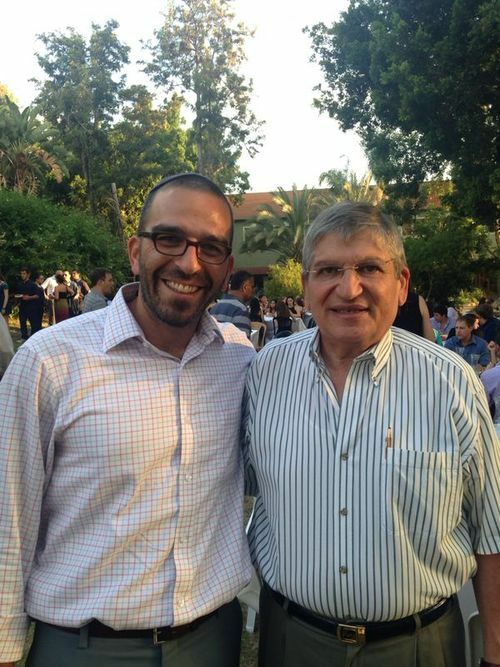 Gideon Meir with Rabbi Leor Sinai, AMHSI Co-Executive Director. The photos from the event will be posted within the next couple of weeks, but to give you a taste of the energy and the spirit of the event, we posted a few videos, among them, this video of our student, Briana Jones, leading everyone in singing the ultimate song for Peace, “Salam.” The song has become somewhat of a symbol for this particular group of students as they have been known to sing it in the secured areas during warning sirens. Click here to watch the video. AMHSI organized a Google+ Hangout enabling all to “virtually attend” the banquet. The full hangout is recorded here. – A message from Russell Robinson, JNF CEO- A message from Dr. Melinda Wolf, a JNF Solidarity Mission member- A message from Gideon Meir, an Israeli Diplomat- Shout outs from Vivian and Glenn Grossman. Click here to see the highlights of the hangout. As we say goodbye to our current students and usher them in to the AMHSI Alumni Association, we are also busy preparing for the Fall Semester session ahead. The new students arrive at AMHSI in less than one month, and AMHSI is busy preparing a very special session for them, combining our renowned academic study program, amazing tiyulim/field trips with fun activities and surprises. Without your support we could not provide the kind of superior academic program and transformative experience for which AMHSI has been renowned for the past 42 years. 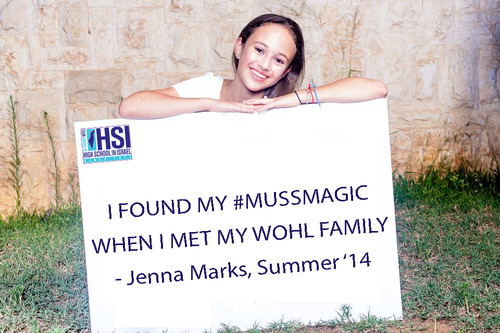 This year we are graduating over 1,000 alumni increasing our AMHSI family to 23,000. Our vision is to enhance and ensure Jewish continuity. Studies we have conducted in the past reflect our success rate which includes a high participation rate within Jewish/Zionist organizations, contributing to Jewish charities, synagogue membership and more. As we continue to provide the best possible program, under the current circumstances impacting every sector of Israeli society, we are including the appeal letter sent to our community and ask that you consider sharing with others. Unlike other Israeli academic institutions, as a non-profit organization, we rely solely on tuition and financial support. For more information, please click here. We appreciate all the encouragement, love and continuous support from you all.